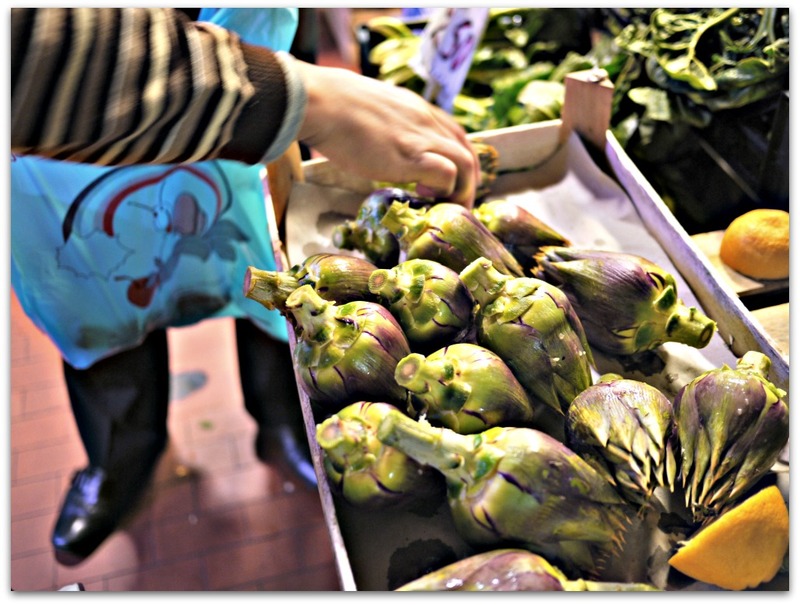 The spring épine artichokes are hitting the markets in Liguria and they're a seasonal treat not to be missed! I admit they aren't the friendliest looking things, more like something a Klingon would eat, but don't let that put you off. Knowing how to prepare them is really quite empowering. 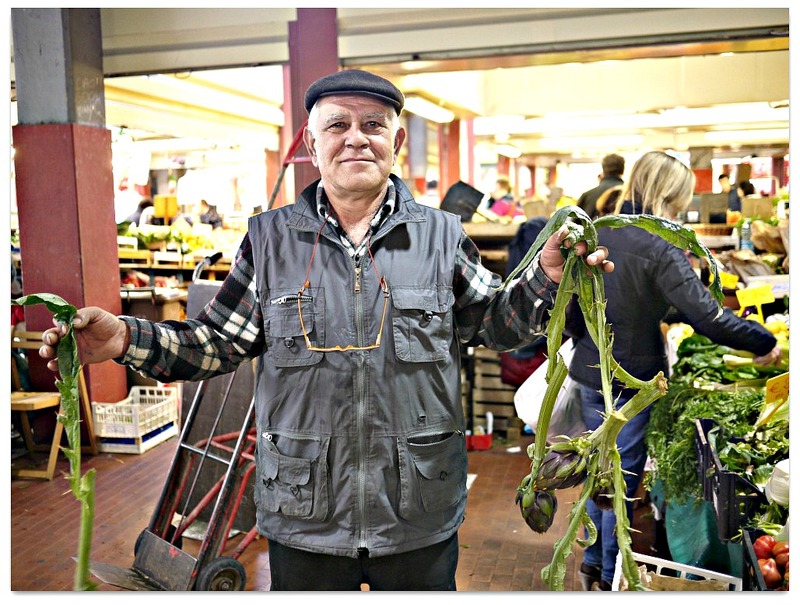 As a public service, throughout the markets in Italy you'll find burly men wielding sharp knives, skilfully removing the tough, spiky outer leaves, rubbing the half naked remains with a lemon and then with one quick stroke, "swoosh!" 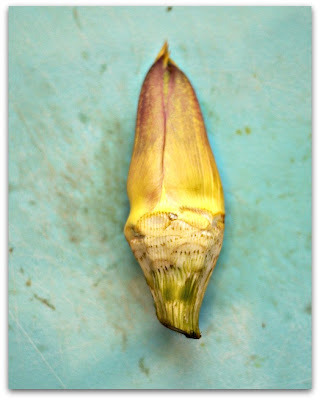 - off goes the stalk! Nice thing is there's no extra charge and it sure makes transporting them a lot safer. 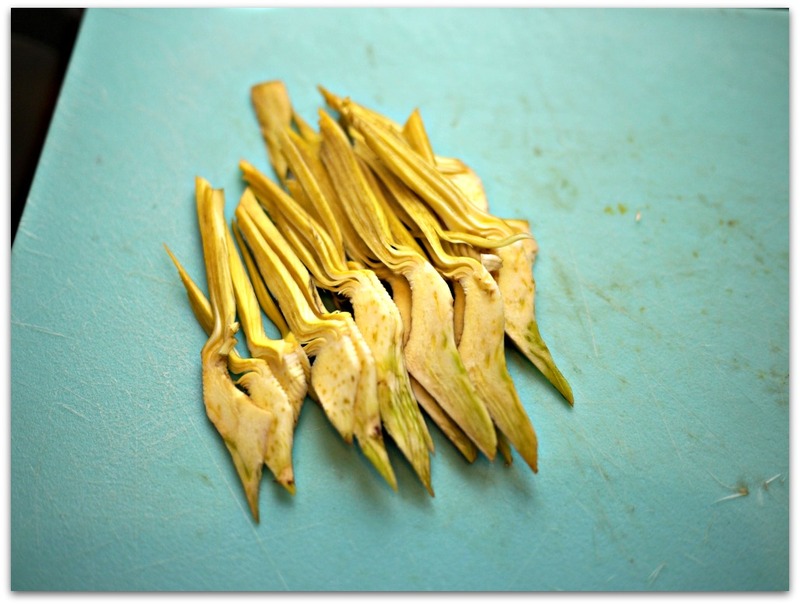 Even if you've brought home some trimmed ones, they'll still need more preparation before they're edible. Unlike most artichokes, épines are fabulous eaten raw and the best part is their soft, tender centre leaves and heart. 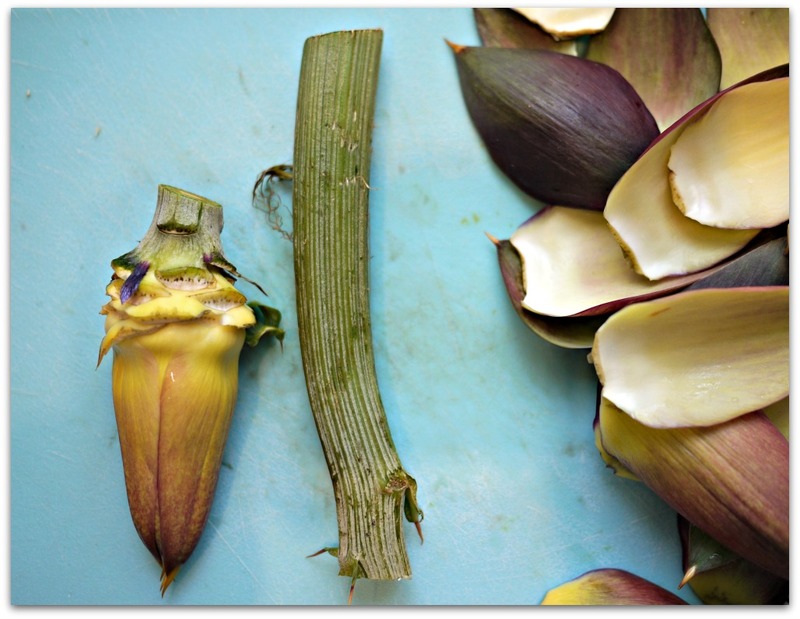 They're the star of one of my favourite traditional Ligurian salads, Carciofi Crudi, Rucola e Parmigiano or Raw Artichoke, Arugula and Parmesan Salad. 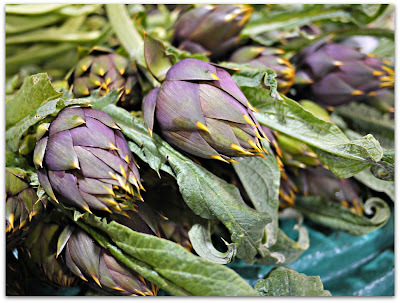 I often wonder who the first brave person was who looked at these artichokes and said, "Hmm, maybe we can eat these!" Whomever it was, he or she must have been either extraordinarily courageous, voraciously hungry, or both. So sharpen your knives, take a few deep breaths and let's get to it! Begin by pulling off the tough outer leaves. 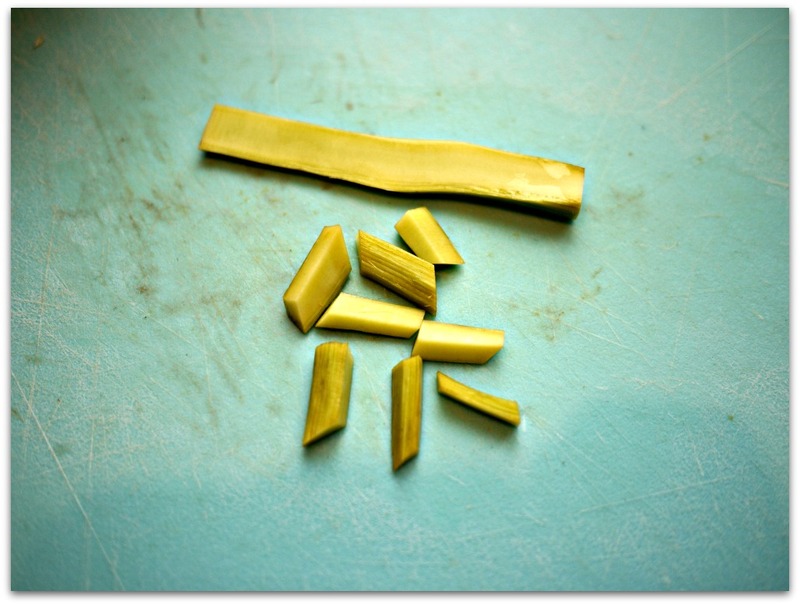 Be careful - the spikes are sharp and really hurt. Cut the stalk from the head. 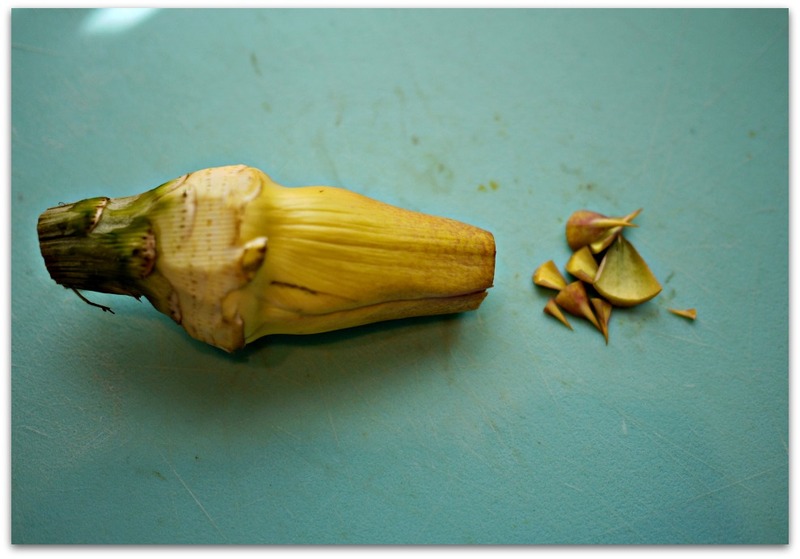 Set the stalk aside. 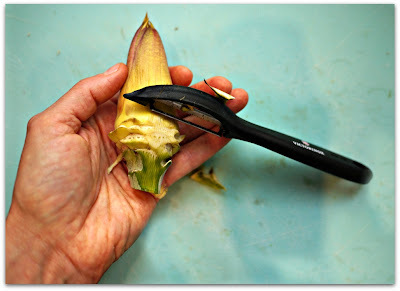 Use a vegetable peeler and peel the lower part of the head where it meets the stalk. Peel it enough to make it smooth. Rub lemon around the entire artichoke when you've finished peeling it. Slice it in half. Rub each half with lemon. Use a melon baller and scoop out the furry bit. That's the choke. 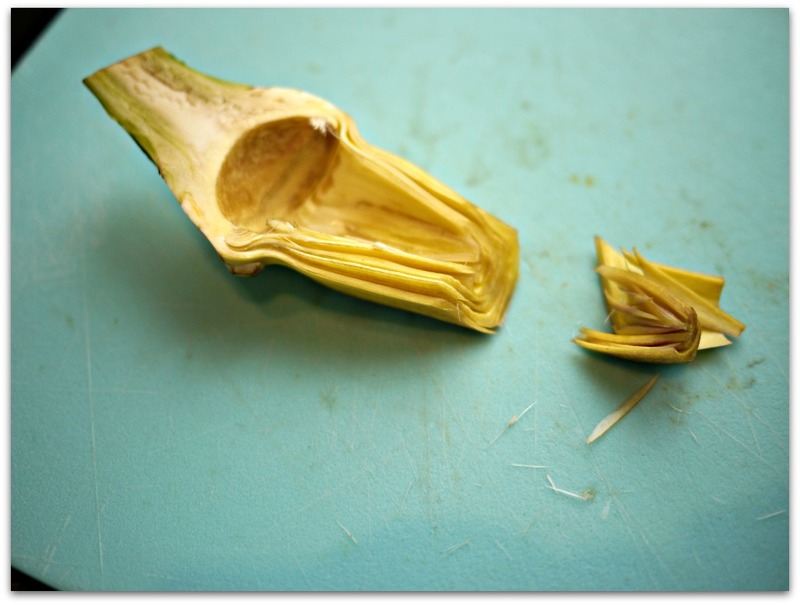 Scrape the melon baller down towards the tip to remove some of the innermost leaves that still have spiky ends. 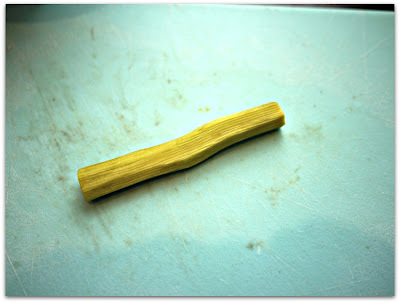 Trim the tip a bit more if you see more spikes. If you are going to eat the artichoke raw, bite into one of the outer leaves. If it seems too fibrous to eat, pull off a few more leaves until you reach ones that are more tender. 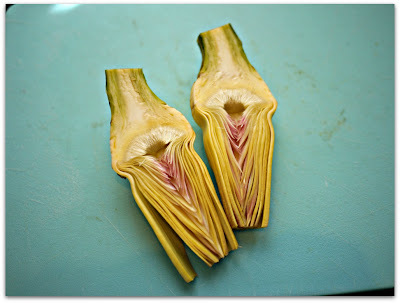 I'm preparing these for an Carciofi Crudi, Rucola e Parmigiano salad otherwise known as Raw Artichoke, Arugula and Parmesan Salad so I flipped the cut side down and sliced them thinly. At this point you can place them in acidulated water if you're using them in a different recipe. 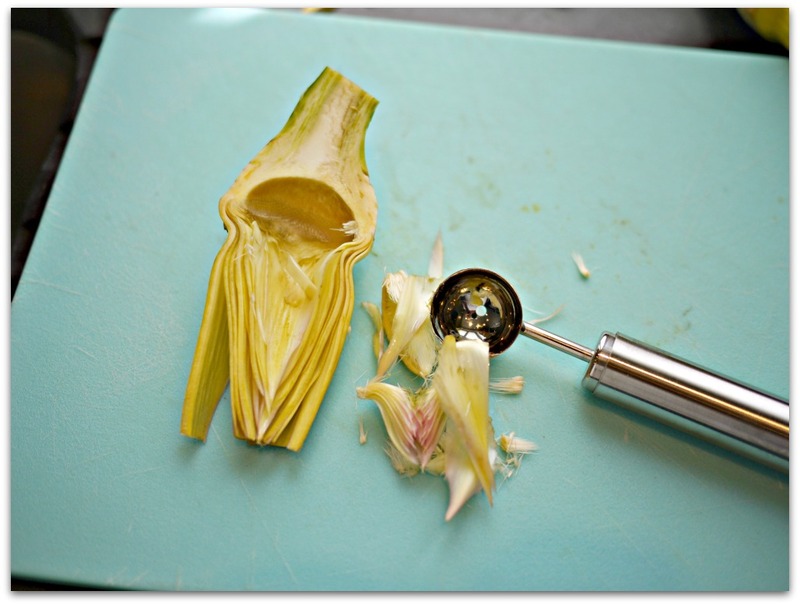 To prepare the stalks, use your vegetable peeler to remove the fibrous outer layer. Halve the peeled stalk and cut it into pieces. 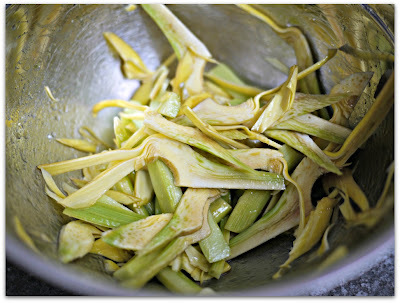 Here are the finished artichokes coated with lemon and olive oil, ready for the Artichoke, Arugula and Parmesan Salad. There! 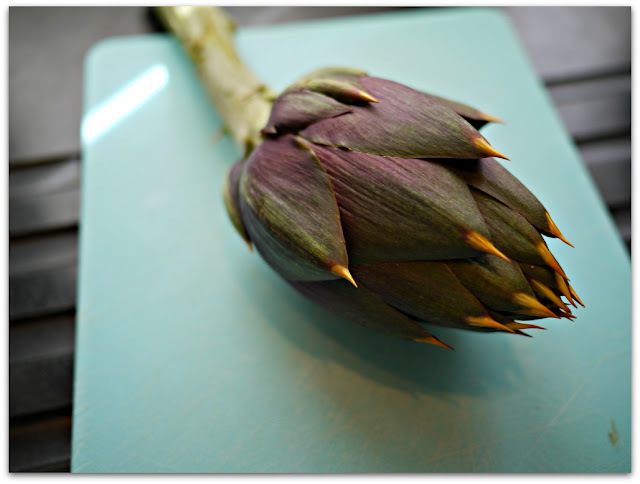 You've graduated from artichoke school. Brave, fearless you! I can't believe I almost missed this post because it is SO helpful! 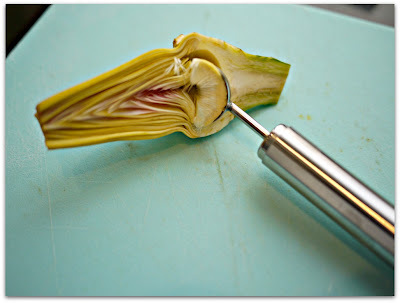 I still get intimidated by fresh artichokes, unless I'm just steaming them and picking apart the leaves to eat them. You make it look so simple here! Wonderfully helpful! 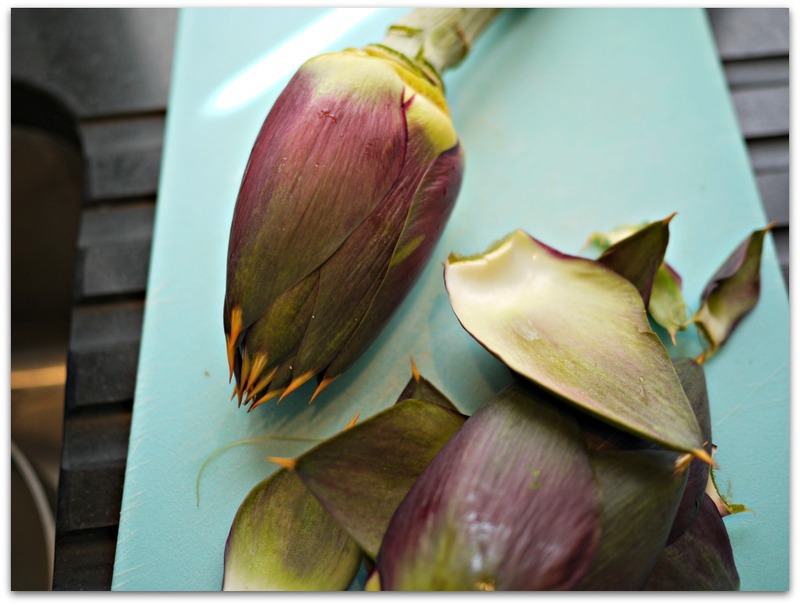 I'm linking this post to my upcoming piece on artichokes for HandPicked Nation.